welcome back to the final day of the papertrey ink october countdown to new stamps, including merry kiss-mas from me. today i wanted to challenge myself to create non christmas cards using this very christmas set! first up, two birthday cards. every time i have a die cut shape that could work for a banner, i create a card with this layout and these bows are no exception. a bow birthday banner had to happen! each bow is two layers with the baker's twine sandwiched in between. the ends are looped and hung over shiny black brads found in my bottomless studio. but, instead of sticking the brads through the paper, i bent both prongs the same way and tucked them behind the layer. i used the same colors i used the other day because they were on my desk, but colors could easily be changed match the recipient or season and sentiments for any occasion would work - even christmas! next, i put a bow on a box! to create the present, i scored lines 1/4" apart diagonally across a 1-3/4" square - just big enough to stamp the xoxo's in rows to create the look of wrapping paper. it's hard to tell in the picture (thanks to late night photography! ), but i covered the bow in glossy accents so that it had a little extra dazzle and shine. either of the two bows would work for this idea and again, colors could be changed to match the recipient. it could also be created for christmas too, but this time: hugs & kisses, birthday wishes! so the bows were kind of the easy answer to this challenge, but did you know the mistletoe has an alterego too? the image reminds me of dried flowers hung upside down, so that's exactly what i made it look like! i used the smallest flowers in betsy's brushstrokes kit, stamped and colored a little more with copics to get the edges, and pressed a stylus into the center on a foam pad. 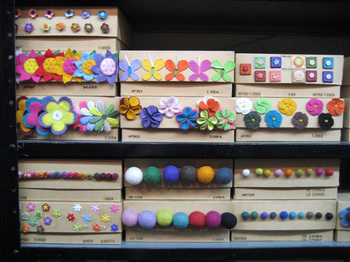 any small flower die or embellishments would work as well. assembled with a twine line stamped accross the frame and a bow of the same, now it's a stem of flowers hanging up to dry. if friends were flowers, i'd pick you - an oldie but goodie from green thumb! when in nyc, shop 'til you drop! 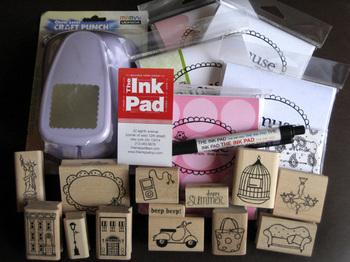 i found a link to a stamp store in greenwich village called the ink pad on the a muse website. of course, i had to go. it's quite small, but it packs a big punch! it was hard to take in all the stamps and i had no agenda other than adding to my a muse collection, so as you can see, i did just that! the women working there were so nice, too. one was wearing the a*muse*a*palooza t-shirt, which just underscored my "mission"! plus i got the giga scalloped square punch that i've been wanting. i have no ink with me here, but i can't wait to test these goodies out on an a muse challenge as soon as i get home! they also had a really cute ruffled bag/purse stamp that i'm kicking myself for not buying too--it's just like the purse i carry and get lots of compliments on--i'll have to call and have it sent to me very soon! felt flowers and that cute bird (! 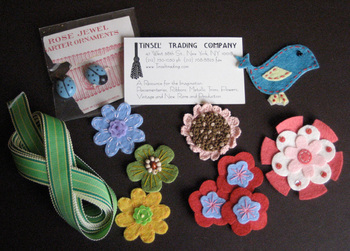 ), a little ribbon, vintage ladybug buttons--can't wait to use them! so, those were my two crafty stops--i figured two was a doable number for david. i also very much enjoyed walking down 5th avenue, especially sephora, lacoste and saks, and we had a lot of fun in chinatown, too--purse, handbag, pocketbook??? it's crazy!